Look no further for custom tabletop & counter glass. 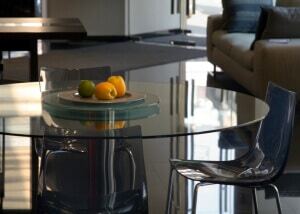 With an extremely fast turnaround, table top & counter glass can add a dash of personality to your home. We offer installations, repair and replacement. Our custom tabletop & counter glass options can help make your home look striking. Not only do table tops look great, they protect your tables and furniture from wear and damage such as glass rings and scratches. Over time, you can simply replace the glass to give your furniture a brand new look. Our glass can be used on top of existing tables and furniture, or as the table top itself. We can cut the glass to your exact specifications, and make a custom bevel to make sure you get the exact look you want. Looking to make your kitchen pop? Talk to us about glass counters! Glass countertops provide a smooth contemporary look and feel with a durability on par with stone countertops. With a huge selection of embedded textures and the ability to infuse custom colors in the glass, we can create a custom solution that will turn your kitchen stand out from the rest. If you like the look of our glass tabletops, ask us about creating glass shelves! These standalone units can provide great storage for books and movies while shining bright.